Gather ‘round everyone. Make yourself comfortable because this one is going to take a minute. When the topic of 90’s Japanese performance cars comes up, we as car enthusiast tend to beat the proverbial dead horse. We rattle off the Toyota Supra Twin Turbo, Mitsubishi 3000GT VR-4, Mazda RX-7, and the Nissan 300ZX Twin Turbo. We stake brand allegiances, javelin the performance specs, and take magazine shootouts as God’s word. We are so very passionate about these vehicles because they represent our realistic dream cars. They are our idols we can actually strive to obtain. The early 90’s played host to a whole slew of high performance sports cars that were developed during Japan’s vibrant economic bubble - a bubble that would ultimately burst a few years before many of these cars were released. The enormous amount of development resources that the Japanese auto manufacturers invested during this economic period can be seen by the technology present in these automotive offerings. Twin turbocharging, active aerodynamics, four-wheel steering, and electronically adjustable suspension; you name it, they had it. Today, the steadfast cult following of these iconic vehicles has meant that prices have remained relatively strong. Just take a look at the price of any clean Toyota Supra. However, a few models still have an approachable buy-in price for the budget-minded buyer. Enter the complex and gorgeous, venomously fast, Nissan 300ZX Twin Turbo. I wanted one badly, and I’m about to show you what it actually costs to buy one. I have always been fond of the Nissan 300ZX (Z32) design. Low slung, wide and adorned with headlights that even Lamborghini couldn’t say no to. Blessed with 300 horsepower from the factory when the twin turbo engine and manual transmission were checked on the options list, the car can still put modern sports car offerings to shame. Many of these cars, however, have not lived easy lives. If the body kits, Altezza lights and chrome wheels of the early 2000’s haven’t claimed them yet, then the lack of routine maintenance certainly has. These automobiles do not fall into the reliable, happy-go-lucky category of Japanese cars you know so well. The timing belt, for example, needs to be changed every 60,000 miles or 4 years, whichever comes first. Let this slip and you’ll be shopping around for a new engine. Neglect is not something these cars will put up with. Zs come up for sale frequently but what is more challenging is finding one that feels right. Let’s be honest with ourselves, they all need work; even those low mileage, top dollar ones you see on the internet auction sites. Oil seals get old, electrics go wonky, belts need changed and turbo bearings need consistent lubrication. You want one that has been used but loved. Due to the above clauses, it is difficult to pinpoint market values on these cars. 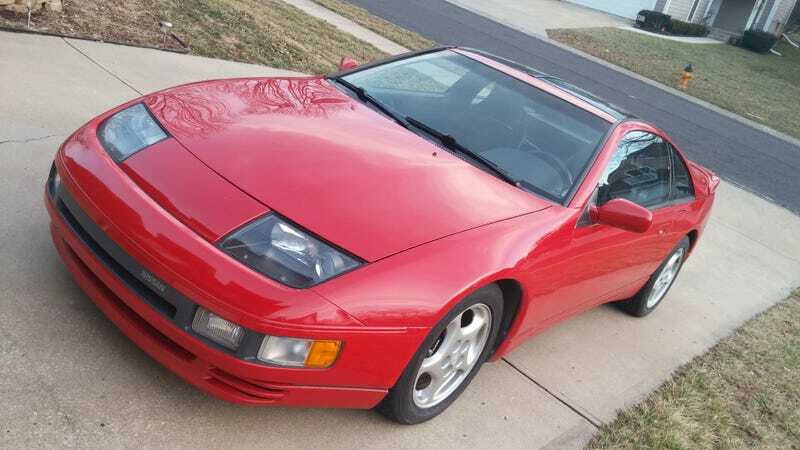 The purchase price is simply the down payment of 300ZX ownership. When I started my search, I knew I didn’t want to spend too much to purchase the car because I figured it was just going to be a starting point; I was going to have to dump a considerable amount of money into making it a usable and reliable car. I wanted a car with cosmetics that were original and honest but also had serviceable mechanical bones. My search for the right candidate went on for nearly 6 months without much turning up. Then, one morning, it happened. You can just tell when the right car shows up. The moment you see the listing you know you have to be the first one there to look at it or else the opportunity will have been snatched up before you can blink. The car was local, priced right and I was on it. Advertised for $3800, it was a one-owner car that had sat dormant for a long time in the seller’s garage. It was a twin turbo with a 5 speed and it had a whole host of tasteful performance upgrades. The engine had been replaced with a factory new, Nissan dealer-installed engine less than 40k miles ago. The original engine was subjected to an all-too-common-but-fatal hydrolock situation. This occurs when the car is driven through an ocean-like foot of standing water following a rain storm. The intake is mounted so low that the engine just vacuums up all the water which results in a bad day. To sweeten the deal, the car came with two thick manila folders stuffed full of service records dating back to the day it was purchased new. But there was a catch, as there always is with these cars. The seller said he had ceased to drive it a while back because the car stopped making boost. The turbo boost gauge would get to an indicated 0 PSI and then the engine would seemingly cut out. He had the car towed to a shop earlier in the year for a diagnosis. The shop determined that a couple of fuel injectors were bad as was the alternator. This sounded like a believable synopsis, especially after researching common issues with the Z32 platform. When I arrived to look at it, it needed to be jump started. When the jumper cables were pulled, the car would immediately die. It had a very obvious multi-cylinder misfire. There were other items that required attention, such as a visibly leaking differential and worn out tires, but I felt these were to be expected for a car of this age. A test drive wasn’t really in the cards as it was in such poor running condition. I was afraid to cause it any further damage. Cosmetically, the car was genuine and in great shape. I’ll admit, there were a ton of negatives stacking up. Nothing is cheap or easy to fix on these machines. Even still, I was sold on the car. It fit my budget and my requirements. This was the one for me. I put in an offer of $3100, which I though was fair for a solid looking car that didn’t really run. The seller accepted it and I found myself the new owner of a Z that was in dire need of some TLC - how much of which was still left to be seen. I threw a new battery in it and limped the car 2 miles home, which felt like an eternity in such a sickly car. On my short journey, some new fascinating things appeared. The oil pressure gauge indicated low oil pressure, and the power steering dashboard light was illuminated. Upon getting the car home, I put on my diagnostic hat and dove in to find how deep the mechanical rabbit hole went. I immediately confirmed a bad alternator after taking a voltage reading while the car was running. This would be an easy enough fix. After that, I researched the oil pressure issue. As it turns out, a sizable dent in the oil pan can cause this low oil pressure symptom. So could a bad oil pressure sensor. Or worse, a worn out engine. I started with the easier diagnosis of the three by looking under the car to inspect the oil pan. Sure enough, the oil pan was dented. I marked that up to being the culprit. I’d figure out how to fix that later. I then moved on to the fuel injectors. Swapping coil packs around in an effort to locate the misfiring cylinders, I was able to locate the two injectors that the shop had reported were bad. Replacing these would be a slightly more expensive fix, but not the end of the world. Next, I looked into why the car wasn’t making boost. I went around in circles on this one for a while but finally came across the last diagnosis procedure that would confirm my worst fears. I removed the compressor hoses from each turbo. The goal was to check for suction at each hose while the car was running. Suction at each hose would confirm that both turbos were spinning and working. The first hose had suction. Great! The second hose? What was left to be deduced? A seized turbo. Case closed. My heart sank. I knew in the back of my mind, before I made the decision to buy the car, that this worst case scenario was always a possibility. I had somewhat prepared my mind for this sort of disaster. Now I knew it was a reality. The engine had to come out, and my rainy-day fund had to go bye-bye. You may have heard that the Nissan 300ZX has an incredibly cramped engine bay. I can confirm that it does. In fact, pictures don’t do it justice. When you open the hood on one of these cars, you begin to wonder how in the hell it was ever assembled at the factory. There is absolutely no room to work. If you need to replace the turbos on one of these, the easiest thing to do is pull the engine out of the car. No joking here, it makes life far simpler. The procedure sounds terrible, and it is. However, if you are faced with a multitude of mechanical issues like I was, removing the engine actually grants you a huge amount of freedom to repair everything all at once. Suddenly everything becomes accessible with all the new found space! Luckily, I had access to a garage, an engine hoist and an engine stand so the idea of engine extraction appeared feasible. It is easy to get carried away when semi-restoring a car. This point becomes even more exaggerated when that car is turbocharged. As you may already know, parts that can potentially give the car more power are priced only slightly higher than the original items themselves. I set out to buy exact or equivalent replacements for the parts I was removing. It wouldn’t be the cheapest route but it would at least assure me with a reasonable amount of confidence that when reassembled, the car would work properly without requiring a bunch of tuning. Before spending a penny, I familiarized myself with all aspects of the 300ZX Twin Turbo. I researched all problems that I could tell my particular car had. There is a tremendous amount of information available on the internet for these cars. After stuffing my brain with as much information as it could handle, I went on a search for parts. It didn’t take long to see that this car did not have Chevy Equinox level part prices. Even the most trivial parts have a premium. For example: $50 for a rear main seal. Eventually you get past the sticker shock simply because there is no alternative. At least all parts are available new which is more than can be said for many other unique vehicles. I created shopping carts from various online vendors, stuffed to the brim with new OEM and aftermarket items. Glancing at the pretty face of the non-running Z, then back to the computer screen, I hit the “Checkout” button. With a now weightless bank account, it was time to dig in to the project that would hopefully bring my dream car to life. New parts! Some of them anyway. While the engine itself was in great condition with less than 40,000 miles, all the mechanical systems feeding into it were in dire need of assistance. And trust me, there are a LOT of engine –related systems on the 300ZX Twin Turbo. This particular endeavor hurt the piggy bank the most. As I mentioned earlier, one of the engine’s turbochargers had seized. This single point of failure meant that not only the whole engine needed to be pulled from the car, but also that every serviceable part from that point on would be a candidate for replacement. It’s what turned this fun, happy-go-lucky purchase into a full-on project. The first step was identifying which kind of turbos were installed so that I could source direct replacements. It turns out they were a “hybrid” style based on the stock turbo housings, which employ slightly larger compressor and turbine wheels. After going back-and-forth with a few turbo vendors, I finally found that my best option was to have the turbos rebuilt. With brand new Garrett CHRAs (the heart of the turbo), 360 degree bearings, and new compressor and turbine wheels, I now had better-than-new “hybrid” style turbos that were rated for higher output than the stock turbos. Even though the cost is considerable, the feeling you get from installing new, OEM-quality parts is unmatched. When a job is this involved, you will never save money by installing the “cheap” option. Even with the engine out of the car, getting to all the nuts and bolts to replace the turbos is an act of flexibility, patience, and determination. This procedure is without a doubt something you get quite proficient with if you do it multiple times, but on your first go around, the learning curve is steep. Having a good feel for how much torque you are applying to a particular nut is paramount, as many fasteners are in locations that you cannot access with a torque wrench. As we all know, oil is the lifeblood of an engine. As a result of oil system components aging, terrible events can occur such as turbos seizing. I wasn’t about plug everything back together reusing old, and possibly compromised, parts. My oil system rejuvenation plan all started with the turbo oil feeding infrastructure. For the brief mile that I drove the car home, I noticed the oil pressure gauge was reading low. After further inspection, I found a sizable dent in the oil pan which was intruding the flow of oil to the oil pickup tube. This required a new oil pan to be fitted. As it turns out, this really was the culprit of the low oil pressure. With the new pan installed, the oil pressure now healthily reads as it would when new. While I was in the neighborhood, I changed out the rear main seal and oil cooler hoses coming from the oil filter tree. The original oil cooler was looking worse for wear. I decided to upgrade to a larger oil cooler to keep oil temperatures down and prolong the life of the turbochargers. There isn’t a cheap way to go about doing this bit of routine maintenance, not that you would want to take the cheap route anyway. I went ahead and installed the factory 120,000 mile timing belt kit for peace of mind. You name it, if it is on the front side of the engine, it got replaced. From the very beginning I knew that there were two fuel injectors that had gone bad. Who’s to say the other four wouldn’t soon follow suit? However, the injectors were just tip of the fuel system iceberg. Every part of the 300ZX fuel system is known to start going out when they reach the age and mileage of my car. In the end, I replaced nearly the whole fuel system to simply avoid being stranded on the road side. New-style injectors and adapter kit installed into the intake manifold. This is something I never even dreamed of getting into when buying the car, but as it turns out, the idle control system on these things is quite complex and almost always in a state of disrepair. You can spend hours attempting to diagnose the peculiarities with the system only to come to the conclusion that half the parts are not working correctly and that individual pieces cannot be bought and replaced independently. If you are experiencing idling issues, your best course of action is to just replace all components and start fresh. Cheap? No. So keep that in mind when buying one of these cars. The car had been upgraded with what is referred to as a “dual pop charger” cold air intake system. It is a popular addition to the 300ZX and allows for significant gains in power. However, it plays havoc on the idle control system. The car would nearly die if thrown into neutral at speed (something that you do more often than you might think in a manual transmission vehicle). This is because there is supposed to be an air deflector in front of the air filter elements to buffer airflow going to the mass air flow sensor. If the mass air flow sensor is subjected to ambient turbulent air, then it gets a false reading which results in the engine wanting to die. This deflector had been removed at some point in the car’s life, so I opted to reinstall a new one. After installing this piece, the engine dying issue became a thing of the past. Some of these repairs were preventative maintenance, such as new oxygen sensors, and some were absolutely necessary, like a new alternator. Incorrect spark plugs were installed in the engine. Did they work? Sure. However, there is a single model of spark plug specifically developed for the 300ZX Twin Turbo engine and they are special-order only. Just take a look below and you can see how significant the difference is between the wrong plug and the correct one. It is the little details like this that make all the difference in a smooth running engine. It’s painful to see how much the small stuff ends up costing. This includes new engine mounts, exhaust gaskets and hardware, new silicone coolant hoses, coolant, oil, filters and all the other odds and ends that are required to assemble a refreshed powertrain. On my initial assessment of the car, I saw that the differential was leaking. That didn’t strike me as too big of an issue. However, it wasn’t until I embarked on removing the engine that more drivetrain maladies reared their ugly faces. Yes, those are large chunks of metal. Where did they come from? Well, eventually I found out that they were the teeth from a gear’s synchronizer. Failed synchronizers are an Achilles heel for 300ZX transmissions so this sort of find wasn’t out of the ordinary. Immediately after finding this, I put out a few wanted ads for a known-good 5 speed transmission. Kansas (where I live) can be a desolate area when trying to track down parts for a somewhat obscure vehicle. A month passed by and I still didn’t have any good leads on a new transmission. Then, out of the blue on Wednesday afternoon, I received a text from a local gentleman who had seen my Craigslist ad and happened to have a rebuilt 5 speed transmission that had been sitting in his garage for more than 15 years. However, there was a catch. It was from a non-turbo 300ZX. The non-turbo and twin turbo 5 speed transmissions are the same in every way except for the starter mounting plate on the bell housing. I figured if I could just swap the bell housing from my bad twin turbo transmission onto this refreshed non-turbo transmission, I would be back in business. So, a deal was made and for a very reasonable $250, I had a new-to-me transmission ready for a bell housing swap. Swapping the bell housings allowed me to see the innards of this new transmission. I was able to verify that it appeared to have been rebuilt, which was a great relief. Below you can see the equivalent synchronizer in the new transmission which was damaged in the old transmission. While reassembling the transmission cases, I noticed that the starter mounting bolt holes were looking a little worse for wear on the twin-turbo bell housing. As a course of preventative maintenance, I went ahead and installed Heli-Coil threading inserts so that the starter could be securely bolted down. I also installed a new transmission mount as the old one was looking a little ripe. Having got the transmission sorted, it was now time to move on to refreshing the differential. Upon removing it from the car, it became apparent that it was in need of some attention. It was at this point that I learned how truly dense and heavy an automobile differential is. What is innocently about the size of a basketball ends up weighing around 120 pounds. While a single person can move it around, the object itself is highly awkward and has spinning parts in the best grab locations. It is far better to have two people. For the most part, it was just me. Great times! After thoroughly degreasing and stripping it of paint, it was time to disassemble the metal behemoth. I pulled out the output shafts and the rear cover and then hit the differential casing with a few coats of black paint. I removed the oil vent valve on the rear cover and cleaned it out. I then removed the old input and output shaft seals and replaced them with new. I bolted the back cover into place with a new gasket. It took way more effort to do all this than I was anticipating, but in the end, it was good that I did it. The 300ZX Twin Turbo has a complicated steering system even by today’s standards. Four wheel steering sounds like a great idea until the realization of its complexity truly hits home. While later 300ZX models employed a hybrid hydraulic and electric steering system, the early models, such as this 1990, used a fully hydraulic system. This means that the front and rear wheels each had their own hydraulically assisted steering racks, and to power these racks was a dual-vane power steering pump which is basically two pumps in one. Many feet of high pressure and low pressure hydraulic hoses complete this techno-marvel package. As with any aging hydraulic system, leaks begin to develop. One of the hardest things to track down is a power steering leak in cramped engine bay like in a 300ZX Twin Turbo. You cannot even see the steering pump, let alone most of the high pressure hoses, without serious disassembly. This car’s system was obviously leaking, with the tell-tale signs of fluid puddles under the car, an undercarriage covered in fluid grime and the HICAS light being illuminated on the dash. It was time to embark on a complete system overhaul. Rebuilding the power steering pump was a far more economical option than buying a new one. In the end it wasn’t an overly difficult job to do either. This is where the real money and time was spent. The hoses are not the easiest things to access, and the high pressure lines are expensive no matter what you do. I went in and replaced everything that looked like it could be leaking. All low pressure lines were replaced with new silicone alternatives. I replaced two high pressure lines as they appeared to be the main sources of the leaks. Installing the new hoses was frustrating but with a little patience and a lot of blood, everything fit back together and sealed up perfectly. Aligning a car sounds simple, but it is only simple if the parts that are designed to adjust, allowing for an alignment to be performed, are not corroded and seized. This 300ZX had been lowered, and when these cars are lowered, aftermarket control arms must be installed to compensate for a drastic change in negative wheel camber. This proved to be an issue because the aftermarket adjustable control arms on the front had been subjected to 20-plus years of road grime. Ultimately, this meant before any adjustment could be made, the control arms had to be pulled off and “un-seized”. I had to put on my creativity hat, but eventually I devised a method to un-seize the control arms to allow for the alignment to be performed. The tires that were on the car were bald, old, and in need of replacement. The original wheels on a 300ZX are staggered, meaning the rears are slightly wider than the fronts. Finding street tires that fit the original rear wheels was a difficult task as nobody makes the size anymore. Nobody but one company that is – Toyo. I was surprised by the affordability of the new set of four tires. It was nice to catch a “break” for once. After getting the tires mounted and balanced on the wheels, it was time to throw the 300ZX on the alignment rack and get it driving straight. When you have a car as fast as the 300ZX Twin Turbo, good brakes become increasingly more important. The previous owner had gone to the great expense of installing brake calipers and rotors from the contemporary R32 Nissan Skyline GTR, along with steel braided brake lines. While these particular components were in great shape, other parts of the system needed some love. Nearly 30 years of exposure to brake fluid meant that the brake master cylinder on the 300ZX was at the end of its life. Fluid leakage was obvious, as was the peeling paint on the brake booster. It was time for a new part. Brake fluid is a nasty thing when it finds a way to exit the closed brake system. Aside from it being terrible for your health if you come into contact with it, it also quickly eats through paint. All of the rubber brake booster vacuums hoses had become old and cracked which made them impossible to remove without completely destroying them. In the end, it meant that this was a great opportunity to install some new silicone booster hoses. Because the brake system was opened, it now undoubtedly had air in the system. After a full brake system fluid flush and bleed, the brakes were in perfect condition once again. Unless you are picking up a 300ZX for track-only purposes, creature comforts are just as important as the mechanical health of the engine and drivetrain when it comes to actually living with the car. Specifically, I’m talking about functioning heating and air conditioning. It may come as no surprise that these cars, when they reach this particular age, require attention in these areas. On my brief journey driving the car home from the seller’s house, I noticed the peculiarly sweet scent of antifreeze in the cabin. Having driven other vehicles that exhibited such an odor, I developed an initial diagnosis that the car’s heater core was nearing its expiration date. The heater core is a small radiator, usually hidden from view behind the dashboard, where hot coolant from the engine passes through. A small electric fan blows air through this hot radiator, and the resulting warm airflow comes out the vents throughout the cabin. Thus, you get warm air when the heater is on. When you start to smell engine coolant in the car, this typically means the heater core has sprung leak. Replacement of the heater core is simple on some cars. You just unbolt a cover behind the glove box and the heater core is completely exposed allowing you to easily swap in a new part. But on the 300ZX? It’s a huge ordeal. Everything behind the firewall must be removed. This was a job I was most certainly not looking forward to. It is one thing to get greasy and dirty when working on the engine in the paint-protected confines of the engine bay. It is another to risk spilling antifreeze all over the inside the carpeted interior of the car. Not to mention the complexities of the numerous electrical connectors, bolts, clips and various tabs and snaps that you encounter when removing the dashboard. Upon disassembly, I happened upon a critical detail that was mentioned nowhere in the factory service manual nor in various related forum threads. The A/C system must be opened before you can physically remove the heater core. This is because the A/C evaporator is adjacent to the heater core under the dash. The plastic casings that house the heater core and the evaporator are interconnected and will not allow you to remove one without the other. This sort of conundrum is what makes a long job turn into an excruciatingly painful process. I had to reassembly everything, take the car to a mechanic shop to evacuate the A/C system, and then come back home and start the disassembly all over again. Great! Eventually I was able to extract the heater core from the vehicle. Only at this point was I finally able to verify my hypothesis that the heater core was leaking. While the parts cost for the heater core replacement was one of the lowest compared to the rest of the procedures I’d done on the 300ZX, it was quite possibly the most time intensive and one of the most emotionally taxing jobs. However, doing a repair correctly, such as this, more than makes up for the in-the-moment frustration experienced along the way. As I mentioned in the heater core section, I had to open up the A/C system. For those unfamiliar with automotive A/C systems (or any A/C system, really), “opening up” means disconnecting the metal hard lines that contain the gas refrigerant that the A/C system uses. You cannot simply open these lines and release the gas into the atmosphere, as knowingly doing this is illegal for environmental reasons, which is why I had to take it to a mechanic shop to legally “evacuate” the refrigerant gas out of the system. This sounds fine-and-well enough, except, as I found out, there was a sizeable roadblock waiting ahead when it came to refilling the A/C system. Cars built prior to circa 1994 had A/C systems that were filled with a refrigerant called R-12. This refrigerant is now outlawed and no longer easily obtainable. What that meant was I now had to convert the whole system to use the new, readily available refrigerant called R-134a. This refrigerant is supposedly better for the environment should it escape the confines of the A/C system (i.e. car accident). To do this conversion, many steps were involved. I had to remove as much of the old mineral refrigerant oil as possible. This started with pulling out the A/C compressor and flushing it out. I then refilled it with the correct amount of ester oil, which is compatible with whatever amount of the old mineral oil I could not extract from the system. I then fitted R-134a-specific adapters to the charging ports. These are required in order to get the new gas into the system. Afterwards, I cleaned up the A/C evaporator, because I already had it out and so why the heck not. I then replaced the drier canister with a new one. Next, I replaced many rubber O-rings in the system to ensure a leak free connection between various system components. Once the system was completely reassembled, I took the car to a shop to have the system evacuated to remove any moisture that had gotten into the system and to ensure that there were no leaks. Once passing the leak test, the system was refilled with R-134a refrigerant. Phew! What a pain. But, now the system is somewhat future-proofed and blowing cold air. The interior is completely reassembled with all fasteners finding their homes and all electrical connectors reconnected. As the masterful Edd China would say – Result! While the 300ZX was in great original condition for the age, there were some cosmetic spots that could be improved on without the need to take it to a professional auto body repair shop. Having traveled 168,000 miles over the course of 27 years, the front bumper had seen its fair share of rocks, sand, shopping carts and who knows what else. The lower portion of the bumper needed a full repaint, there was a large crack present on a support gusset, and the middle section was indented with a large section of paint missing. Remove the bumper gave me the access I needed to conduct the needed repairs. I repaired the crack with mesh screen and epoxy kit. Afterwards, I ordered a color-matched paint kit that included all the components to perform a high quality spot-repair to the plastic bumper. After installing the bumper back on the car, I applied the lower striping tape and “Nissan” decal. Having gained confidence in spot-painting, I decided to tackle a paint imperfection on the passenger front fender. There were a lot of odds and ends that needed tidying up to make me feel like the car was “complete”. I ordered a brand new set of key blanks, including the titanium master key, and had them professionally cut to match the car’s locks. Other items included wiring harness clips, hood hinge covers, and other details. Some of the more noticeable repairs are show below. The Nissan Skyline GTR (R32) brake calipers were looking worse for wear because the paint had mostly chipped off. They were mechanically in great shape so I decided to do a quick repaint with high-temp black paint to shine them up. The windshield wiper arms and cowling were looking weathered so I removed them and brought some new color to them. While I was there I installed new Bosch wiper blades. Inside the interior there was one glaring eyesore. The boost controller and turbo timer controller had been mounted with a terrible looking piece of foam crammed into the one of the center console DIN locations. I fitted a few pieces of painted Plexiglas sheets to sandwich the controllers and isolated them with some rubber to make it look a bit more “finished”. While not perfect, it arguably came out looking better than the alternative. When contemplating undertaking a project like this it is important to realize that you really have no idea what the final complete cost will be until after it is all over. You can only give it your best guess. This is because there is a considerable amount of hidden and unpredictable costs. These include random hardware purchases, cleaner and degreaser products, electrical connectors and spools of wire, towels, scuff pads, grease and other assorted shop supplies. While inexpensive by themselves, they can become noticeable when added together. Undertaking an overhaul such as this is not for those who are interested in a quick flip. Just because you may have purchased the vehicle for a steal of a price, rarely will you come out on the other side with a vehicle that is still under “market” value. You have to want the car, and you have to want the end result even more. Once you reach the finish line you will typically end up with a car that you can trust and enjoy far more than any other comparable vehicle on the market. So, there you have it. In addition to the initial purchase price of the vehicle, it costs around $8000 and almost five months of straight weekends to bring one of these cars back to full health. If you were to have a competent shop perform the work, they may be able to cut the labor to a third of the time I spent. Even still, the labor rates would quickly surpass the parts cost. There are less expensive ways to get into a 300ZX Twin Turbo. There are more expensive ways to get into a 300ZX Twin Turbo. However, the factor that stays consistent with them all is age - there are no new ones anymore. They have all aged, regardless of miles, and will need work sooner or later. The figures above serve as a realistic minimum-cost guideline to bring one of these cars back to full health. Up until this point, I had never driven a 300ZX Twin Turbo. Well, I had never driven a working one. I had gotten behind the wheel of a non-turbo version a few years ago and I felt that it was quick, but not exactly fast. Needless to say, it was difficult to hold back my excitement to try this car out. Anyone who has done a somewhat involved disassembly and reassembly of a vehicle knows the importance of performing a shakedown before testing out what a machine can really do. I drove the car around for an easy 300 miles – it felt like an eternity, but it was necessary. Once satisfied that everything was working as intended, I opened her up. It was genuinely fast. It was turbo-car fast. The kind of fast that doesn’t hint at itself until midway through the revs, then BOOM, the turbos spool up and it slams you into the back of your seat with no signs of letting up. The whole car comes alive. The sound of the turbos, exhaust and intake fill your ears with a blissful mechanical noise. Before your senses have a chance to take it all in, you’re already finding the next gear, the blow-off valves chirp, and you’re right back into the power band. I never thought I’d own a car that made so many wonderful sounds and had the power to back them up. Like in the beginning of this project, disbelief was beginning to merge with reality, but this time, the feeling was different. This time, a great sense of happiness and contentment overcame me. All of the late nights, bloodied knuckles, and shed tears were finally justified – it was alive, and it was mine.